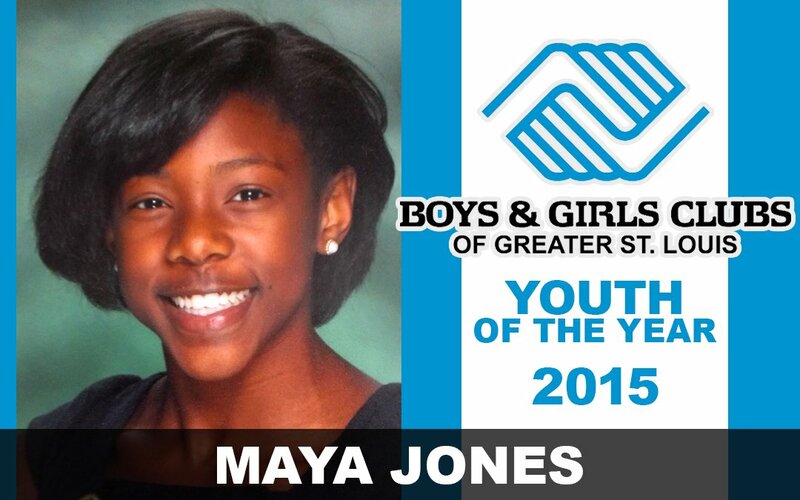 Boys & Girls Clubs of Greater St. Louis is pleased to announce the winner of our 2015 Youth of the Year competition, Maya Jones. She was selected among three other member contestants who shared their story of perseverance and dedication to their family, Club and community. As the new Youth of the Year for the Boys & Girls Clubs of Greater St. Louis, 15 year old Maya is a true example of an extraordinary young woman and is being recognized for her sound character, leadership skills and willingness to give back to the community. “The Youth of the Year award represents the culmination of the personal, academic, social and civic development realized by Maya Jones. We are so proud of all of our Youth of the Year participants who took the time to complete this challenging and worthwhile process. All possess the ability and ambition to be successful leaders,” said Dr. Flint Fowler, President, Boys & Girls Clubs of Greater St. Louis. Maya Jones is a sophomore at Soldan International High School and achieved a 3.5 GPA during her first semester of the school year. She has been a member of the Boys & Girls Clubs of Greater St. Louis – Adams Park Club since she was eight years old. Maya also represented the Adams Park Club during the 2014 Walgreens Expressions Challenge where she helped write and direct the film “It’s on Us” to address the need to prevent teen suicide. Maya’s team won 2nd place and a cash award. Maya plans to pursue a degree in Zoology and explore opportunities to save endangered species when she graduates from Soldan in 2017. As the new ambassador for Boys & Girls Clubs of Greater St. Louis, Maya will now advance to compete against other Boys & Girls Club members from across Missouri for the state Youth of the Year title April 14-15, 2015.